Describe what you made. 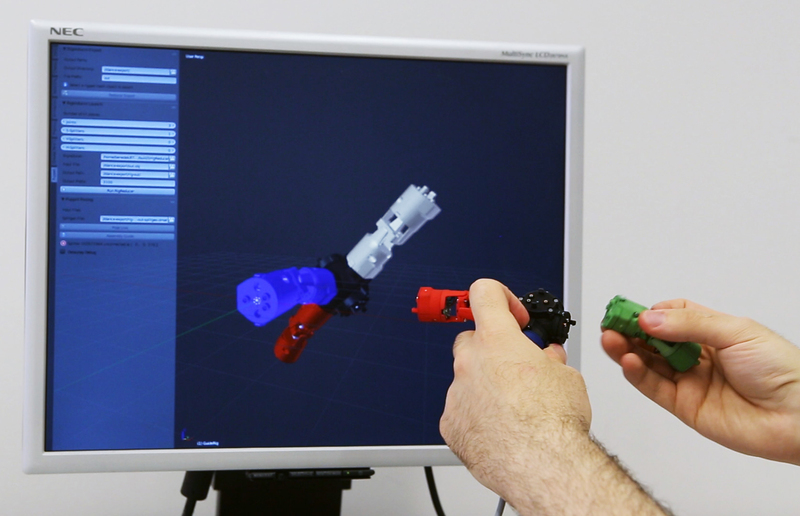 We developed a novel modular and tangible input device for digital character animation. It consists of joints and splitter parts. A novice user can assemble these parts into a skeleton that allows for the positioning or posing of any digital character. Our approach combines hardware with sophisticated software. An optimization algorithm suggests compact device configurations to the user. It optimizes these configurations for a specific digital character with the help of a small set of sample poses. This way, complex characters with hundreds of degrees of freedom can be animated using only 5 to 10 physical parts. Our tool interfaces with the two most popular 3D-animation tools, Autodesk Maya and Blender. The tangible input device consists of two main types of modules: splitters that allow for branching (black) and joints for the necessary degrees of freedom (color). Briefly describe the process of how this was made. Our tool allows novice users to animate digital characters without extensive training. Traditionally, 3D characters are animated using a mouse and a keyboard interface. This is a difficult and tedious process with a steep learning curve, due to the mismatch between a 2D input device and a character living in a 3D world. This mismatch led to the idea to create this tangible input device. The first hardware prototype was developed in the scope of Oliver Glauser’s 2012 master’s thesis. This prototype was then further improved and combined with a software for character posing. In 2014 we demonstrated this combination at ACM SIGGRAPH in Vancouver and at ACM UIST in Honolulu. We received a lot of positive and inspiring feedback. Since then we completely overhauled the hardware, adding universal joints for more intuitive manipulation of the device. We also added substantial new functionality and automation on the software side. Last year, we presented this latest version of our project at ACM SIGGRAPH in Los Angeles and at ACM UIST in Tokyo. The three main prototype steps of the essential joint parts: from oldest (left) to newest (right). What for you is the most important thing about what you made? That we went all the way to a complete system. Only with all the components together is it actually a useful tool, able to reach a wide audience of novice users. A very motivating experience in this regard was the 2015 Cinekid Festival in Amsterdam, where we could witness how much fun kids ages 8 to 16 had in animating 3D characters with our device. An explosion view of all the components that the latest joint version is made of. What expertise (skills and competences) did it require? Four main areas of technical expertise were involved: computer graphics, human-computer interaction, and electrical and mechanical engineering, with researchers from labs in all these areas. We had to design the mechanical parts with the three degrees of freedom corresponding to a ball-and-socket joint. These degrees of freedom for each joint have to be continuously sensed, and the acquired data has to then be transmitted to the computer at interactive rates. Once transmitted, it has to be interpreted and applied to transform a virtual character in a way that is intuitive and easy to use. The user is interactively guided while assembling the suggested device. The already correctly connected parts of the device are displayed in color and the ones still missing in light grey. What materials and tools did you use? To measure the current rotation in each joint, we use a combination of magnets and Hall effect sensors, which sense the direction of a magnetic field. To collect and transmit the sensor data we designed compact custom circuit boards and corresponding firmware. We wanted the newest version of the joints to be able to twist infinitely around their own axis. Therefore, we used so-called slip rings to transmit electrical power and signals while the joint is rotating. It was surprisingly difficult to find a suitable producer, as we needed them in a small form factor and exactly according to our specifications, but finally we found one in China. The set of circuit boards is placed within the colorful shells. We designed them with CAD software and had them produced by an online service with a 3D powder printer. Everything is tightly held together by traditional screws and nuts. The hardware blueprints and the software code is open and can be found online (http://oliglauser.github.io/atamid/). The tangible and modular input device allows a wider audience to animate complex digital characters. A dragon with more than 100 degrees of freedom can be animated with a device consisting of four joints and one splitter.